Tara Brach | Namaste. . .
“There is no reason for us to huff and puff,” he (Thanissaro Bhikkhu) says, “when we can just breathe.” Finding pleasure in our meditation practice is essential if we are to continue sitting with any regularity. So, with book in hand, sit back, pay attention, and breathe!” ~~ from James Shaheen in Commit to Sit. I can remember the first time I sat for a full day. Wow. What torture I put myself through. I had been meditating for some time already and thought I was ready to sit with a group. I was nervous about being there. I was looking for a community. Looking for instruction. Looking for a place to belong. Maybe that was a lot to ask for. I think that it was a daylong retreat and we started with a short session the night before. I had driven 3 hours to get there. Had to find a hotel and check in. Find the center. And then deal with my nervousness. What was it going to be like? I knew about this tradition but not about the topic of the retreat. Was I going to be able to handle it being with strangers? I remember being a few hours into the meditations the next morning and I had so much pain. . . my back, my shoulders, my neck. . . I had never experienced that at home. I didn’t see then that I was trying so hard. I wanted to be the perfect meditator. Think about what the instructions are… sit down, get comfortable, relax, keep a straight back with an open heart, and follow your breathing… what could be more simple? But no… not me… (does this sound familiar) I had to do it right. Maybe they would like me or talk to me during the breaks if I did it right. Maybe they would see I had mastery over all this. . .
A round of walking meditation and creaky cold feet on an even creakier wooden floor. Could I be any more self-conscious rather than being present? Oh no, the bell was invited again and I have to go sit on that cushion again. How am I going to get through the next 45 minutes? It seems like it will never end. Time seems to creep along . . . I notice every twitch, itch, and sigh. . . but not my breath. And when I do realize that I’m not focusing in on my breath, I start to beat myself up for it, or pity myself, or feel defeated and alone. All that from just being asked to sit and watch my breath. . . but isn’t that what we do? We create so much drama and cast ourselves as every part in the play. I think about this experience in relation to my work with grieving people and to my own grief. When we grieve, we are simply loving. . . just like when we meditate we are simply breathing. . .
We are loving the person who is no longer in the room with us. . . no longer there to hold, to talk to, to ask advice from, to worry about, and everything else that we do when we are in a relationship with someone we love. There is a fundamental simplicity about grieving. And we add so much more to it. We add a lot of huffing and puffing as Shaheen relates in his writing above. We don’t show ourselves a lot of mercy. We push away the feelings. We tell ourselves we’re fine. We put on a brave face. We tell ourselves to be strong for everyone else around us when it is at this exact moment that we should be softening our hearts, our gaze, our minds to the powerful thoughts, feelings, and sensations that accompany our grief. I wonder what it would be like, in our grief, if we had someone like Tara Brach or Pema Chodron to say to us, sit down, relax, open your heart, breathe, and be present to it? This is what Stephen and Ondrea Levine have done for over 30 years. If we sat on that cushion with our grief, our missing that person, our broken heart, our bittersweet memories, do you think we could get past the thoughts of doing it right in the eyes of others? Do you think we could allow some ease to come over us, with time and practice so that we didn’t have the achiness that I experienced during my first daylong retreat? I wonder if we sat with our grief, setting a timer so that we had a container of time to sit in, and gave ourselves time to sit with our breath, if we could allow memories, feelings, storylines, to come. . .
Could we get to a point where rather than grasping to the past, the minute to minute details of our relationship with that person, could we allow those details to come up for us, wave a friendly hello at them, and allow them to pass without clinging on to them as if it was the last time we would ever be able to experience them? I think that would be a session I would like to try and sit and I am wondering what about you? Would you try to sit on your cushion, tall, with an open heart and straight back? I am sure that we would start off with achy muscles, crackling joints, puffy eyes, and a stuffy nose. . . but what if we could sit through that. . . what would be there on the cushion for us? Would we maybe come to find unconditional friendliness and lovingkindness for myself and for all people who were hurting and missing someone? I wonder if, when you or I find ourselves in the midst of grief again if we can sit and breathe, be present and learn to relax the strained breathing and grasping to find our true nature . . . .
Look around right now. . . Does it reflect your interior space too? Is the room you find yourself in cramped, cluttered, in total disarray? If it is, are you in the middle of being creative. . . turning the chaos into magic? Or it is the dark claustrophobic like cramped, “this doesn’t fit” kind of space? Is the desk or table you sit at made of fine wood, leather, marble? Or is it a 2×4 between milk crates because you aren’t buying furniture because you aren’t staying long? And what color our your walls? Are they three shades of off white? Are they rich deep hues like wine, forest, crimson? Are they light and airy like a French kitchen? What about windows, light? Is there a sense of spaciousness? Does the air feel stagnant and stale or is there a crisp fresh breeze? Now take a minute and close your eyes. Breathe in and out slowly, 5 times. Get in touch with your physical body and after you do, pay close attention to your heart space, your third eye. . .
Is your perception of your physical space mirrored in your body, mind, spirit? Do your relationships and work resemble the area? Are you satisfied with your answers? If so, savor the feelings of coherence with your world. If not, ask yourself, what now. . .
New to Meditation? Looking for a Peace and Calm? I have a former client that I saw not too long ago. He’s on a journey, like all of us, and has many of the same stuck places we have. I listened while he told me that he didn’t have time . . . It reminded me that he was the kind of person who wasn’t going to be interested in the sweet calm of Thich Nhat Hanh or the empowered feminine wisdom of teachers like Pema Chodron, Tara Brach, or Roshi Joan Halifax. He was a scientist and this whole thing was well, woo woo and hog wash.
What might, I got to thinking, as even MBSR was shot down as a suggestion was Mark Thornton’s Meditation in a New York Minute: Super Calm for the Super Busy. I’ve listened to the audiobook a few times. At first “glance”, listening to it on my commute to hospice, I used to think it was technique-y. He was young, a corporate-type, and addressed the matter of meditation like a professional speaker. Hmmmm, sounds like just a different shade of “I’m too busy, I know better”, etc. This former client, this scientist, this closed-hearted person gave me a gift. He was a wise teacher that brought me back to this audiobook with a new awareness. 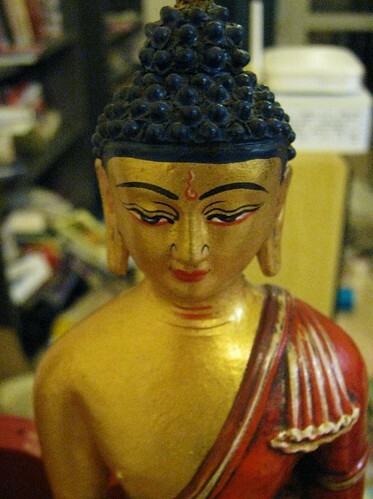 Wise in the way that Pema Chodron talks about in our troublemaker teachers. I am still not sure that this will go on my top 10 list, but Mark’s straight forwardness that probably works in corporate America, cut through some things for me. 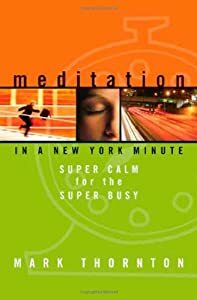 I would suggest the book or audio for anyone who has said, I want less stress, I want calm, but just can’t get started. I learned new things when I listened to it again this time. I plan to share some of his work because I think that, especially if you aren’t interested in a spiritual path, this words and techniques can be really helpful. Mark’s technique for teaching meditation is simple. Start off small and allow your embodied awareness to be fostered during mini breaks throughout the day. it can be 60 seconds now, 10 minutes later, 2 minutes later . . . Think of it as if they were talking about getting your steps in.. you “should have” X-amount of steps every day or X-minutes of exercise every day. But, they find that 5 minutes now, then, later, etc is still effective. And so can your meditation if you design it this way. 1. Relax – they tell you this all the time. They told me as I began my first All-day sit at the Shambhala Center here in the midwest, but, no, I had to do it perfectly. . . and ended up with pain, stiffness, stress, etc. I realized the concept of No-Effort when I hooked up to biofeedback and realized that what I was doing as meditation and “relaxation” was stressing my system out more. It was a lack of teaching; it was that I was not understanding in an embodied way. 2. Have a sense of playfulness – Lately, I have realized how little playfulness and lightheartedness I have in my life. Part of that is being away from family and friends that I love. Part of it living in the middle of no where with nothing that I find fun to do. Part of it is not allowing myself to experience freedom and expansion. If I am not doing it in life, you know that it’s not happening on the cushion. A friend suggested a comedian the other night and I laughed out loud, by myself, for the first time in a long time. Foster a light touch and a sense of inquisitiveness for the sake of your mental and physical health. 3. Practice Gentleness — This reminded me that Thay used to talk about holding your hands on your lap as if you had a baby bird or the baby Buddha in your hands. Gentleness. But we also practice gentleness in our minds as well. No screaming and shouting at ourselves when our minds saunter off. No judgment, just being. 5. Build Calm through Attention — As Mark simply put it. . . where your attention goes, so does your energy. My friend had a problem with some plumbing. Within little time, she got to a place of, oh good, new paint, no walls, new plumbing. . . not me, I thought, all that expense, all that time off from work, all that noise and dust… yes, this is why I sit and am not yet one with my enlightened self. . . point is, her attention went to the positive and the potential. And it was a great experience. 6. Build Calm through Your Intention to drop to your core — Mark defines meditation “as a way to directly experience your heart, moment-to-moment, so that others feel it.” So Law #6 is about setting your intention to be in your heart-space, allowing yourself to sink down into the essence or core of who you are, rather than to grasp at the discursive mind that we allow to rule our lives. 7. Maintenance of Calm — How do you maintain calm (or super calm as Mark likes to say?) moment to moment awareness and when you drop away from that and you realize it, drop the storyline and come back to moment to moment awareness. Huh? 8. Repetition — And how does this all get tied together? In the same way you get to Carnegie Hall. . . practice, practice, practice. What I like about Mark’s audio is that he uses the word mindfulness once or twice only. He gives us different language, a different way of looking at the practice. Sometimes teachers use the same words, the same teaching stories, and it doesn’t sink in. That’s probably why relying on one guru isn’t probably the best way to go and we have many over a lifetime. His work is not devoid of spirituality, he talks about spiritual masters, quotes Indian texts, but he’s no-nonsense, engaging, and I did get the feeling like I was watching someone who could be on Oprah’s network, cheering us all on. But let’s face it. . . if you’ve ever meditated you have probably gotten hooked, been judgmental of your thoughts, feelings, and sensations, and gotten down on yourself. We don’t all naturally cheerlead ourselves into health and happiness. So if a cheerleader comes along it’s good if we listen to their pep and cheer. More to come on Mark’s work. . . let this sink in. Think about your own practice in these terms and ask if it jives for you. And if you don’t have a practice, hopefully this will intrigue you enough to want to know more. Meditation is a way of living. It’s not to just be picked up when you lose your job, are flattened by pain, exhausted from caregiving, or broken-hearted over loss. It is a way of living congruently while we learn to foster compassionate attention and intention. Thank you Mr. TroubleMaker teacher for coming around and getting me to set the intention to go back to this audiobook. Any nun who can tell you that she joined the spiritual community because she wanted to kill her husband has to be a teacher for today’s world. I became Buddhist after I watched a video tape, in a philosophy class at a Catholic college, of Thich Nhat Hanh. I don’t even remember which one as it was so many decades ago. But I remember thinking, I never met a priest in my parish that had a smile that big and had the outlook of a wise childlike being. And to this day, I am grateful to Thay’s teachings and to his sangha. His community in the mid-West was a welcome refuge for me when I moved here. 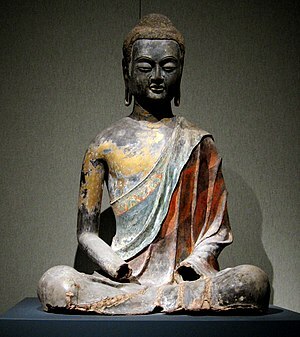 And Thay has always seemed like an embodiment of the Buddha. . . the loving, sacred heart of the Buddha, much in the same way that HH the Dalai Lama is the embodiment of the analytic mind and compassion presence of the Buddha. I revere both, but always feel like how they live, their lessons, etc will always be out of reach for me. And then I read my first book by Pema Chodron. And I listened to my first audio book and I thought, “Oh, I get this! Hey, I think she just swore… and oh look, she’s from my part of the country” and Buddhism became real and personal and attainable some how. Ani Pema was the first female Dharma teacher whose work I was introduced to. But there have been many others since then and hopefully more and more women will be embracing the Dharma and sharing it within their fields. I am so thankful to the female Buddhist teachers today. Tara Brach, Ani Pema Chodron, Roshi Joan Halifax, Cheri Maples, Sharon Salzberg, and Sylvia Boorstein have made the Dharma accessible for women in the West. And there are more and more therapists, like Irini Nadel Rockwell, Tara Brach, and Tara Bennett-Goleman are adding to the body of literature in bringing Buddhist thought to Western Psychology. These great teachers have taught me more about being present to a client and being a compassionate presence to the dying and bereaved than anyone in my academic endeavors. I honor them and their passion for their respective work. May the merit of all these women inspire a new generation and help to foster compassion for all sentient beings.